It was so fun to see this exhibition going up at SeagerGray Gallery the beginning of the month and discovering a new artist: Liz Steketee. 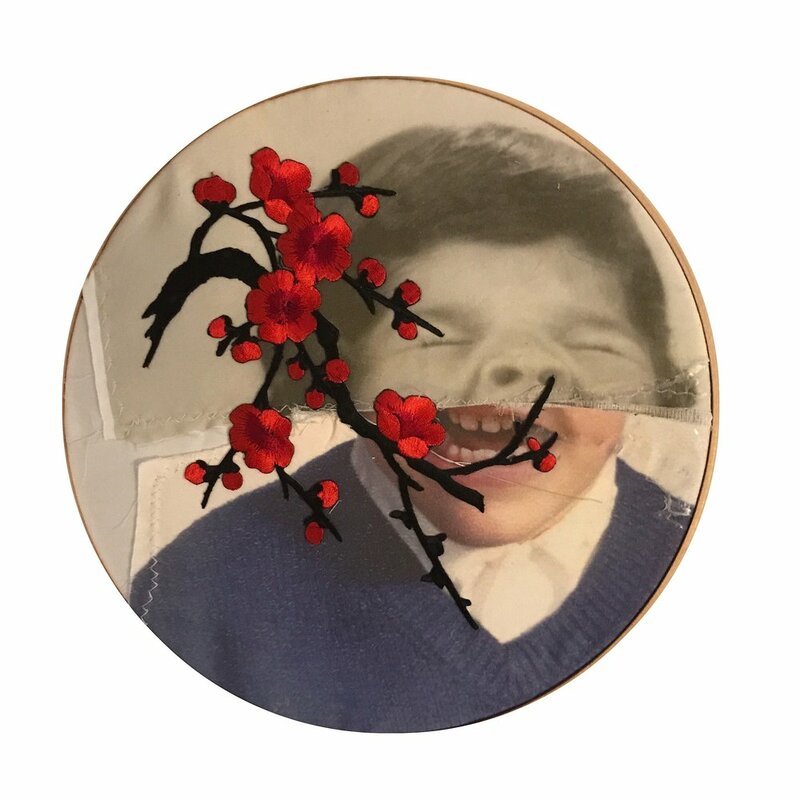 She had this amazing photograph and embroidery piece in multiple hoops that just stopped my heart. And then on her website, I found these! I do love a red thread. June feels so far away, yet it is not. I am working on these paper forms in my studio while the weather is still wintery, but hoping to get outside in another week or two to start cutting the styrofoam bases for these shapes. We are supposed to get another snow this weekend and I am hoping it is the last! I do enjoy being indoors and stitching on these, and just got caught up on Season 5 of The Americans while doing that, and I bought my pass for Season 6! It is three episodes in and I am so nervous for what is going to happen to the Jennings family. I am also very nervous for how all these parts are going to come together into a piece and once the sun starts shining regularly, I should know more. I so love the texture of the eyelets layered on one another. I have backed off to a single stitch to attach them to save time, so they're a little loose. I kind of like that movement they can make. So in my weekly image google search of contemporary (fill in the blank); which has been embroidery, sculpture, fiber arts, etc. But today was mixed media, I discovered the ceramicist Angela Dieffenbach, an artist in Chicago. I love this work and you can see it here! It is weirdly about the body, animal bodies, bodily functions and science. More and more I am thinking I need to takes some ceramics classes. It is speaking more to me as a medium the older I get. this one was made along with the other two, but it is in my exhibition in Bel Air, Maryland. More information to come! I have never made a work specifically for a space, that lives only in that space and time. For "Stitch and Rend" I created my first site specific installation. These are the same sewing pattern paper with eye closures attached. As I was thinking about this piece, I hoped that the thread would be again sewn through the eyes and extend beyond it's borders to a needle in the wall. I hoped the thread would pass through that needle and back to the paper. As I got started I realized the needle did not have enough body to give me the tension I needed, and my old eyes and not so nimble fingers couldn't work through all those needle heads. I went with #17 1 inch brads instead, and it worked great. I pinned the squares to the wall, but hoped with enough tension and thread, the squares would float above the wall. I really enjoyed working across the three. I'm torn on the outcome. I love the mass of thread in the 2-D pieces and really wanted to see that same amount of layering. At the same time, it felt like these needed to be in the process of growing towards those other shapes and too much thread wouldn't allow for that. But finally, there was only so much time and I still had other work to finish. This piece is a real beginning for me, and I can't wait to see where it goes. The gallery director had not yet been through to adjust the lights appropriately. I am looking forward to posting finished installation images when I get them. opened at the Chesapeake Gallery at Harford Community College on June 5, 2014. I was out in Bel Air the week before finishing up new work, installing the show and visiting with my dear friend Jeff Ball. Jeff is the art historian at the college and curates one exhibition a year for the gallery. This year he was kind enough to ask me. The exhibition includes nine dolls and three new two-dimensional pieces. I worked right up until the last minute, but it was worth it. I'm really pleased with how it all came together. Remember this? This was a little study I was working on along with the new dolls. There are two new ones that I am beyond excited about. Each of these is approximately 18x27 inches. All three are made with vintage sewing pattern paper fused to interfacing. In both of the larger works, I cut the original piece into parts and sewed it back together. You can see the top stitching in red. Then I sewed on groups of eye closures and worked stitches of varying lengths and color through the eyes and back again. Finally, I played with the measuring tape motif, much like with the dolls. I can't begin to describe how much fun these are to make, and all of the ideas they have inspired in future works. They are unframed and hang from the wall with needles at their corners. I had hoped to have these done for the exhibition "Spring Gear," but I wasn't even close when it came time to ship the work. I am holding onto them for my summer short exhibition at the Groveland Gallery in Minneapolis, MN. She has different sized sewing needles embedded in the paper clay of her belly. Each of the needles has a portion of thread that hangs beneath her legs. She has three dowel portions embedded in her belly to hold the bobbins and thread spools. When I was a little girl, my mom sewed everything from my day dresses to horse blankets. Next to her machine she had this wooden thread organizer; it was large and square with rows of two inch posts, and it was filled entirely with spools. I loved it. Loved all the color and pattern and possibility. This is for her.